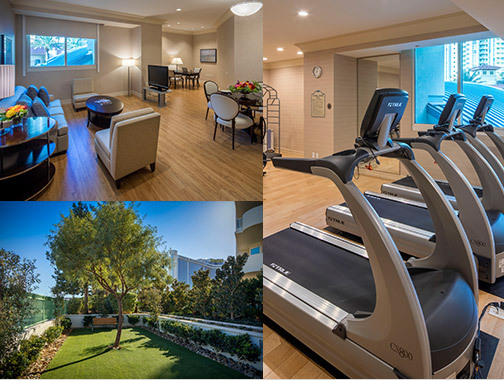 Turnberry Place is a class-A, four-tower, full-service condominium community located in the heart of Las Vegas, the entertainment capital of the world. It's one block away from the world-famous Las Vegas Strip and a stone’s throw to an eclectic collection of shopping, gaming, entertainment, and fine dining establishments. Experience security and exclusivity, as soon as you approach the Grand Entry, to the moment you walk into your Turnberry home -- acquaint yourself with sophistication, friendly staff, and the full service 24 hours a day you deserve. The Green Building Initiative (GBI) is pleased to announce that Four Turnberry Place has earned 4 Green Globes® certifications for its tower and common areas. The Green Globes certification assesses green building best practices for energy and water use; resources; emissions, effluents and pollution controls; indoor environment; and environmental management systems.